I get asked all the time if I can recommend any Korean restaurants in the area, especially whenever I meet fellow Americans. In addition to our one and only local restaurant here in Essen, Sarangbang, I recommend several in Düsseldorf. Right in front of the Hauptbahnhof (Main Station), there is the closest I’ve seen to an Asiatown in Germany. It’s known more as “Little Tokyo” as you will find lots of Japanese noodle and sushi restaurants, Japanese hotels, and karaoke bars. We even celebrated my birthday at a Japanese restaurant with a Michelin star. The German butchers in the neighbourhood even have meat cut for Japanese dishes like Sukiyaki and labeled in Katakana. You will also find a cluster of Korean restaurants, grocery stores and noraebang (Korean-style karaoke) conveniently located here as well. I already wrote about Korea (not to be confused with Korea Haus) here. This is a go to place for a traditional dining experience. You’ll get great service, good quality food (barbecue, stews and soups), and authentic atmosphere. Kalbi-tang (short rib soup) – the hearty and thick flavor is visible through the milkiness of the broth. My daughter particularly loved the glass noodles. Kimchi bokkeumbap (fried kimchi rice) – my husband’s cousin who was visiting from Korea ordered this. She complimented the dish. It wasn’t terribly spicy, but at the same time it wasn’t bland. Yukgaejang (spicy shredde beef and vegetable soup) – again, the soup had a rich, beef flavored broth. It also struck the balance of silky onion-family vegetables (leeks, scallions), egg, and glass noodles with shredded beef. Plus, they got the bright oily red color right. Bulgogi (barbecued beef) – for lunch, this is served on a dish with some rice. Since it isn’t grilled at the table, you somehow miss a dimension of flavor and experience, but it still was tasty. 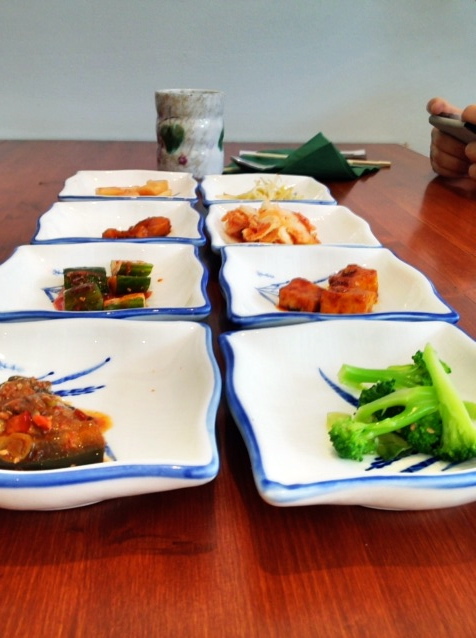 Mul naengmyun (cold noodles) – our au pair ordered this. She didn’t realise that you had to add vinegar and mustard to enhance the flavor, but she said it was still good. I’ll probably try this in the summer. Om-rice – it was a bit oily, but again, they really get the simplicity right. Om-rice is after all a simple dish: fried rice with egg flavored with ketchup. The seasoning was perfect putting in the comfort of this comfort food dish. Jjamppong (Chinese-style spicy seafood noodle soup) – this was perfectly spicy, and the noodles were the right chewiness. We’ve also ordered the sundubu jjigae (soft tofu stew) and jjajangmyun (Chinese-style black bean sauce and noodles). While these were properly done: right color, consistency and texture, the flavor was just OK rather than great. Lunch dishes come with a spring roll or soup. While spring rolls aren’t typically Korean, the way they deep fried and seasoned this thing just tastes Korean. There are even more dishes on their menu that we haven’t tried yet. I’m confident recommending anything here, especially for lunch. I’m impressed that they’ve preserved the authenticity of Korean food here without overcompensating for the German palate. Don’t be put off by the fact that most of the friendly wait staff is not Korean, which I know we all use as a litmus test. You’ll see a good mix of Koreans, other Asian especially Japanese and Germans dining here. Oh, and they also serve hot barley tea, something that my kids and I find comforting and love. I’ve also heard Shilla recommended by other Koreans but have not yet tried it out. It’s in the Korean Restaurant Guide Germany. I have it in mind to try everything in here before the year ends. While I am already in a comfort zone and have my favorites, I remain open to discovering which strengths and specialties each restaurant has. Have I missed anythign? Tags: Dusseldorf, Ginseng, Jane, Korea restaurant, Korean food in Germany, Korean restaurant Dusseldorf, Korean Restaurant Guide Germany, restaurant review. Bookmark the permalink.